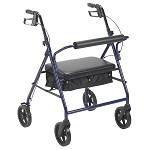 Bariatric Rollator, Blue • Large 8” wheels with locks • Loop style brakes • Padded seat with easy-folding system • Straight padded backrest • Nylon pouch for storage • Limited lifetime warranty on frame 90 days on all other parts • Weight Capacity: 400 lbs. The Roscoe Bariatric Rollator is made with an extra-strength, reinforced aluminum frame designed for patients up to 400 lb. 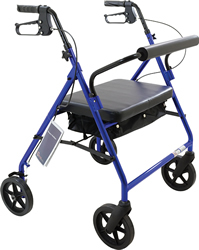 The 8-inch wheels provide improved mobility for indoor and outdoor use. Comfort is not sacrificed as both the extra wide flip-up padded seat and straight padded backrest are standard as well as a handy storage pouch. An easy-folding mechanism, reliable loop style brakes and a durable finish makes this an attractive choice for your bariatric patients.